Are you one of those individuals who want to grow chickpeas in the garden? I think you are! If so, do you know how to grow chickpeas? Known to be the tastiest complete protein out there and with lots of health benefits, chickpeas are relatively easy to grow. There are just important things to consider within the process. ​Here, I will be helping you out when it comes to growing chickpeas. Aside from the steps you need to follow, I will also include significant facts about chickpea. So, read on fellas! 1. First, let us talk about the site. 2. Next, the planting time of chickpeas is indeed necessary. 3. And finally, even if the process on how to grow chickpeas is relatively easy, still you should follow the right way of planting and spacing. Step 1. Sow the seeds indoors by putting them a quarter of an inch to the soil. Step 2. Use biodegradable pots. Step 3. Plant a seed or two in every pot. Step 4. Give the seeds enough water and sun. Step 1. Pick the right location. Step 2. Get the soil ready. Step 3. After the frost passes, you can now transplant the seedlings. Step 5. And finally, bury the entire seedling pot. ​Step 1. Regularly water the plant. Step 2. As needed, mulching is crucial. ​Step 3. Fertilize it with care. Step 4. Carefully handle the chickpeas. Step 5. Properly manage the pests. Step 6. Be cautious about signs of disease. Step 1. Harvest them fresh. Step 2. Harvest them dried. Also referred as garbanzo beans and gram, chickpeas are considered as beans, but botanically they are neither beans nor peas. 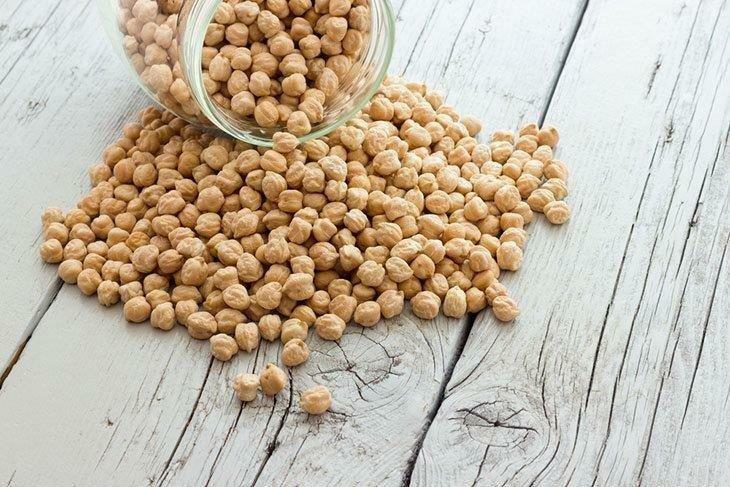 Chickpea is a tender annual legume, and a bushy plant which grows to about 18 inches tall and it has pairs of dark green and compound leaflets which look like vetch. Also, chickpeas do have swollen, and oblong pods that are about an inch long and wide which contains one or two big and cream-colored as well as pea-like seeds each. The flowers might be violet or white based on its variety. 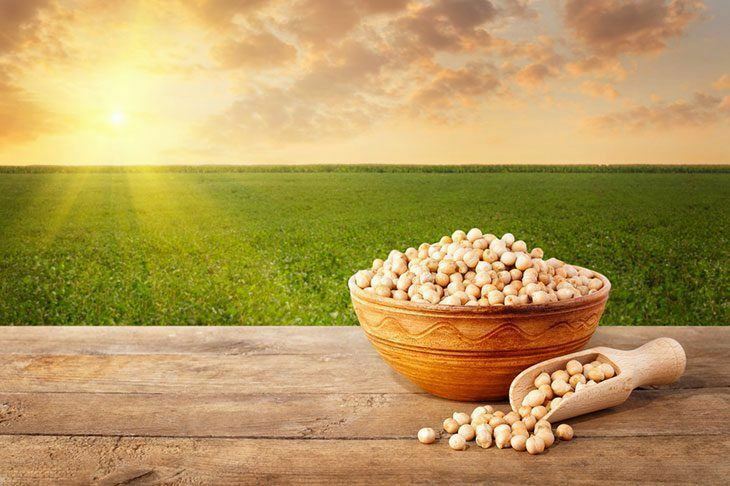 Before proceeding to learn how to grow chickpeas, it is important to take note some essential things about growing chickpeas. You have to plant chickpeas in full sun. They will grow in partial shade however the yield might be reduced. You have to grow them in well-drained and loose soil that is rich in organic matter. Add some aged compost to the planting beds before planting. There is also a need to avoid planting the chickpeas on areas wherein green manures have just grown or on soil with high in nitrogen. Why? Well, this would lead to green and leafy growth and not seed production. Also, add some phosphorus and potassium to the soil. Since chickpeas are considered as a cool-season annual, they need 100 or so days to reach the time to harvest. They are frost tolerant however they grow best in a daytime temperature that ranges between 70 to 80 degrees or wherein night temp that does not dip below 65 degrees Fahrenheit. There is also a need to sow the chickpeas in the garden as early as two to three weeks prior the average last frost during spring. They also need a long growing season and to get a head start on the season, you have to sow chickpeas indoor in a paper pot, or a peat then transplants the pot and plant whole to the garden once the plants are already three to four inches tall. You have to sow the chickpeas 1/2 up to 2 inches deep and spaced 3 to 6 inches apart. You have to thin the successful plants to six inches apart and cut away the thinned plants within soil level using scissors in order not to disturb the roots. There is a need to space the rows 18 to 24 inches apart. 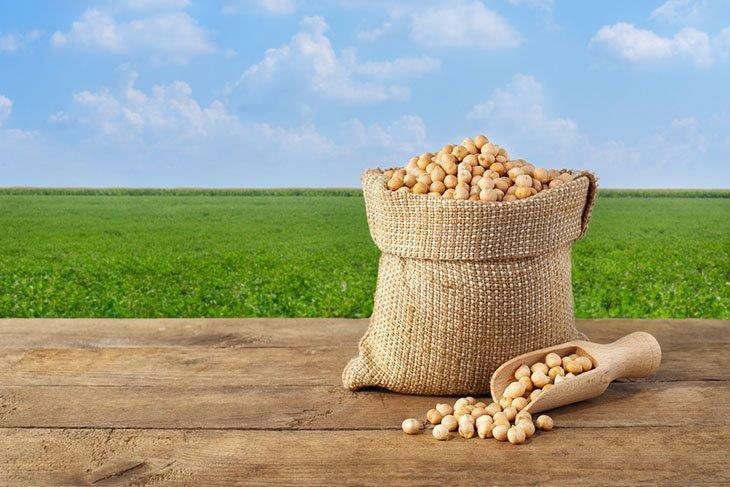 Avoid soaking chickpea seeds before sowing and heavy watering right after sowing in order to keep the seeds from cracking. They allowed to grow a bit crowded offering support to one another. 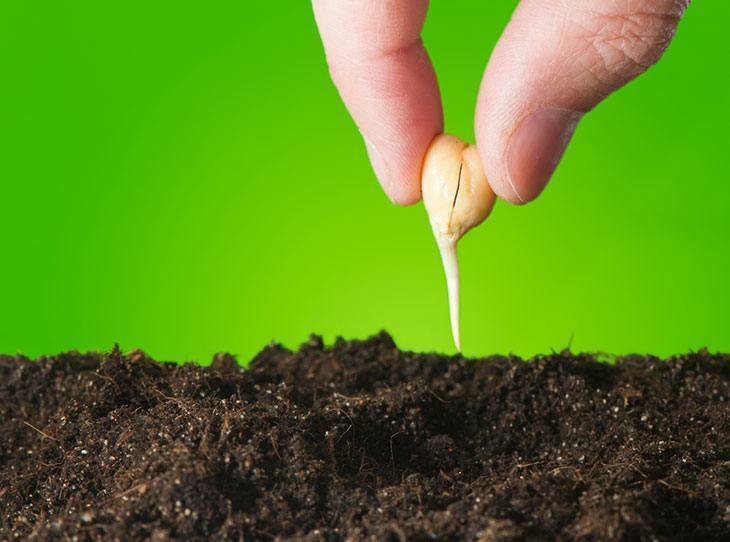 After knowing some important notes about planting chickpeas, let us now learn the steps on growing them. This guide will be divided into four parts - planting the chickpea seeds, transplanting the seedlings, general care, and harvesting chickpeas. Begin the seeds for about four weeks before the date of the last expected frost. The seeds are a bit fragile, so there is a need to sow them indoors rather than planting them in the cold ground. 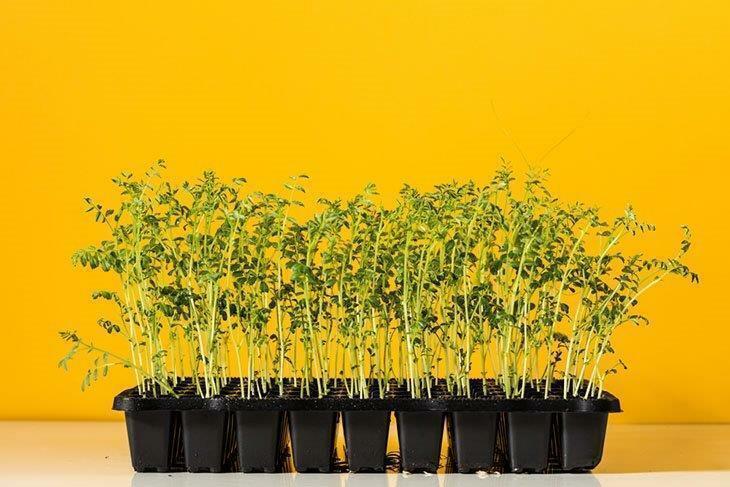 Chickpea seeds don’t transplant well so you must use peat or paper seedling pots which could be planted to the ground directly rather than using ceramic or plastic containers. You might purchase them at most garden centers or online. You need to fill the seedling pots having a little potting soil and plant a seed in every pot and position it an inch or two deep. It is recommended to plant a seed in every pot, but planting two seeds could also be possible. You should water the soil gently every single day. Once it gets hot, watering them twice a day is advised. Put the seedling pots near the window allowing them to receive plenty of direct sunlight. You also need to keep the surface of the soil evenly moist up until the seedlings sprout. Before sowing it, do not soak the seed. Avoid heavy watering right after sowing as they could lead to cracking of seeds. As said earlier, chickpeas thrive well once in full sun, so there is a need to consider an area which receives direct sunlight for at least six hours. It is ideal that the soil must be well-drained and loose that is already packaged with organic material. Growing chickpeas in partial shade might as well be considered, but this might decrease the final yield dramatically. And also, avoid planting in heavy clay soils or in areas that are too shady. Chop in few handful of aged compost a day or even a week before you transplant. This is to improve the soil condition. You might also consider mixing in a fertilizer that is rich in phosphorus and potassium encouraging higher yield. Once you find the soil too heavy, only mix in fine gravel, agricultural sand, or a soil perfector making it less dense and improving drainage. But, avoid mixing in mosses as they tend to trap too much water. Though chickpea seedlings are known to be frost tolerant, they still thrive best once transplanted outdoors right after the threat of frost passes. There is a need for the seedlings to be about four to five inches tall during the time of transplanting. Also mentioned earlier, the spacing is critical as you grow chickpeas. Space them at least 5 to 6 inches apart, and the holes that you dig must be as deep as the seedling pots. A little crowding could be a good thing since they would support one another. Since every hole you dig must be big enough in order to fit the whole seedling pot, you can now put the seedling pot in the hole and cover the edges with additional soil lightly. You shouldn’t attempt to remove the seedlings from the pots as it could shock the delicate root system and might lead to the death of the plants. In most cases, regular rainfall is enough, but once the season is dry, you have to water the chickpeas at least twice a week during the pod formation and flowering stages. You must avoid overhead watering as this could lead to the development of mildew. Just water them at the soil level directly. And cut back on watering the plant if the pods mature and once it starts to die back on its own. It would be enough to do the watering at least once within a week or two. This will encourage drying process. If the weather warms up, there is a need to add a light coat of mulch around its stems. This will retain an adequate amount of the soil moisture that is particularly vital once the plants are receiving full sun. And this could also help in preventing weeds from invading the plant bed though you plan to use even the best weed sprayer. You might add a bit of aged compost or even a similar organic material into the soil around the mid-season of the chickpeas. Still, avoid the use of nitrogen-rich fertilizers. Any excess in nitrogen would lead the leaves to grow a lot bushier and might dampen the yield. And of course, choose the best fertilizer spreader when doing so. 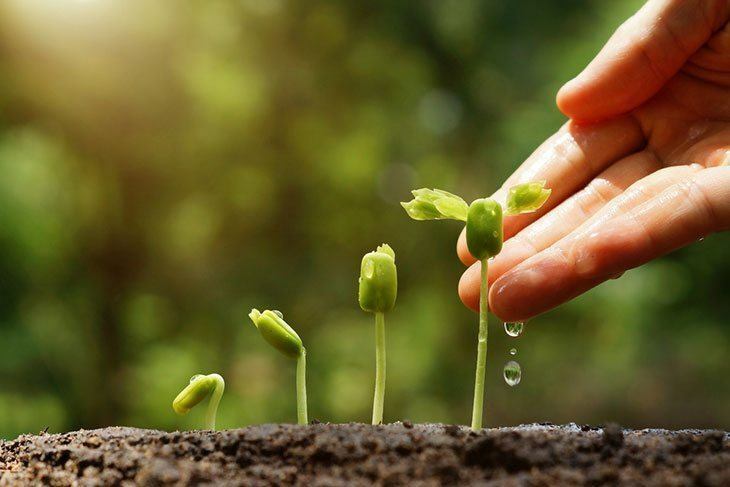 Once removing the weeds or if you are adding anything to the soil, there is a need for you to work carefully as for avoiding disturbing the root system of the plants. Its root system is a bit shallow that’s why working too close might cause damage. Also, avoid handling the plants once they are wet as this could lead to fungus spores to quickly spread. 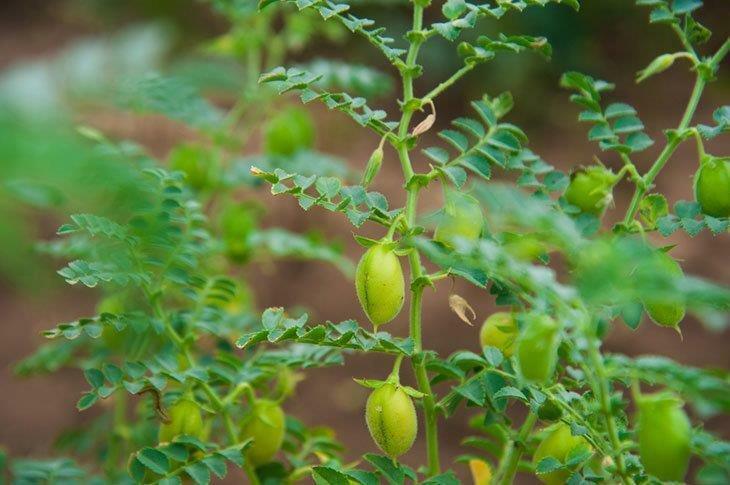 Since chickpeas are vulnerable when it comes to a range of different pests, there is a need to avoid pre-treating the plants for these pests rather wait up until you see the pests. There is also a need to keep your garden free from any debris as to reduce the numbers of pests. The plants are also vulnerable to numbers of different diseases such as mosaic, blight, and anthracnose. In order to avoid the spread of such diseases, always keep the planting bed free from any debris and also avoid handling chickpea plants once wet. And of course, you have to get rid of diseased plants then discard them as for preventing the diseases from the idea of spreading. You can burn them or simply throw them in the trash but don’t ever utilize them for compost. For those who want to consume fresh chickpeas then you could pluck off the pods while they are still immature and green. And eat the fresh chickpeas the same with snap beans. The pods would only reach an inch or two, and each pod could contain a bean or three. Harvesting dried chickpeas is a lot more popular way considered by the majority. You need to harvest the entire plant if the leaves are already withered, and they turn brown. Put the plant on a warm and flat surface then allow the pods air dry naturally in a well-ventilated and warm location. Finally, collect the seeds once the pods split open. 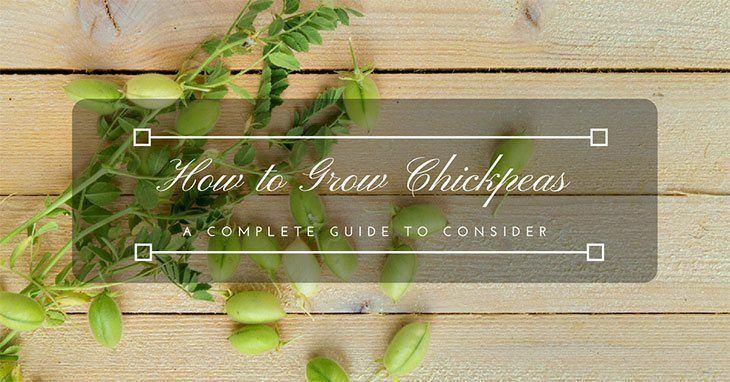 There you have it -- your complete guide on how to grow chickpeas! Indeed, the process seems to be intimidating however if you follow the steps properly, everything will be so easy. From planting the seeds to harvesting the chickpeas, you are guided comprehensively. So, don’t have any second thoughts about growing chickpeas commercially or even in your garden as this article will guide you all throughout. What can you say about this post? Feel free to leave your comments below, and we are happy to read your thoughts! Can I grow chickpeas at home? Are chickpeas hard to grow? Are chickpeas grown in the US?